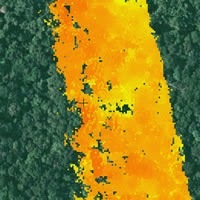 An interesting proof of concept that generated 3D data over tropical forest (DEM and height of trees) using drones (Unmanned Aerial Vehicles) to fly LiDAR sensors has been completed in French Guiana. Interestingly though drones have limitations such as range compared to small aircraft and helicopters, their combined lower flying speeds and heights above a forest canopy gains more dense point clouds and better data. There are implications for tropical forest monitoring and carbon sequestration estimates, presumably at a much lower equipment and operational costs than conventional airborne LiDAR surveys.